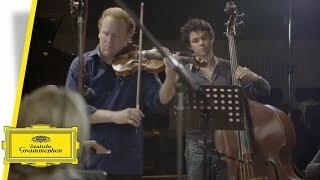 Mendelssohn · Ravel · Reich a.o. Anlässlich Yehudi Menuhins 100. Geburtstag am 22. April 2016 widmet Daniel Hope Menuhin eine Sammlung seiner Lieblingsstücken. Ein besonderes Faible hatte Menuhin für Edward Elgars Salonstücke wie „Salut d’amour“. Erfreuen Sie sich an diesem Liebesgruß! Hope produces a superbly confident and sonorous tone and his performances here would have made his mentor proud.
. . . most satisfying . . . dramatic shifts in mood make Vivaldi's "Concerto for 2 Violins and Strings" an outstanding tutorial vehicle, while Mendelssohn's "Violin Concerto" enables Hope to show the sweet regard in which he held his mentor through his tender delivery of the Andante.
. . . Daniel Hope gives us a carefully thought out and often surprising selection of works that connect with Yehudi Menuhin in a fitting tribute to this great musician on the centenary of his birth . . . [Mendelssohn / Violin Concerto]: [the Kammerorchester Basel,] directed by Daniel Hope from the violin, brings a crisp, purposeful opening to the Allegro with some beautifully shaped phrases. Hope brings a lovely singing tone to the solo part finding some fine timbres as he moves through passages of fast flowing, glowing passages with some wonderful moments, not least in the fine cadenza . . . The recordings are excellent . . .
. . . a showcase for his versatility . . . [on Mendelssohn's Violin Concerto in D minor] Hope and the Basel Chamber Orchestra strike a careful balance, stretching out the long-limbed lines but never to snapping point . . . he's at his most understated in the contemporary works: Tavener's "Song of the Angel" and Henze's "Adagio adagio", where he revels in the music's mysterious half lights. And he's at his most magnetic in the world of folk, which spotlights his particular blend of fire and refinement . . . [Hope leaves the deepest mark in his haunting performance of] Ravel's "Kaddisch" from the "Deux Mélodies hébraiques" . . .
. . . a loving homage.
. . . [a] wonderful collection . . . Hope plays "Duet" by Steve Reich with such conviction and clarity; the articulation of the dissonances are impeccable . . . Hope's playing has a strong sense of fluidity and continuity -- he plays exactly what is heard in his imagination . . . Hope gives Bartok's music some light and is played with a rich quality of sound . . . Hope enunciates each piece with conviction and in a genuine manner. He highlights each of the composer's unique styles and has delivered an all-round solid performance.
. . . Hope plays with a bewitching, occasionally vibrato-less purity . . . in Elgar's heart-warming "Salut d'amour" such is Hope's exultant phrasing that it could almost be the Master himself playing . . . [part of the fascination of this carefully chosen programme] is the way Menuhin's questing spirit has so clearly inspired Hope's own probing exploration of music of myriad genres and styles.
. . . [Daniel Hope's Menuhin tribute CD] has been put together with considerable thoughtfulness and is a stimulating journey through the highways and byways of violin literature . . . [Hope's performance of Mendelssohn's early Violin Concerto in D minor] is beautifully executed, with fully committed playing from the Basel Chamber Orchestra . . . The better part of this CD is the contemporary material, from Bechara El Koury's dreamy and haunting "Unfinished Journey" . . . through Steve Reich's minimalist "Duet", John Tavener's "Song of the Angel", and Hans Werner Henze's "Adagio" . . . each of these pieces is effective and highly accessible. For sheer, unadulterated pleasure, my favorite tracks are the gypsy-inspired pieces: Enescu's "Hora Unirii" and Jo Knümann's "Rumänisch", played with tremendous energy and virtuosity by Hope and members of the Deutsches Kammerorchester Berlin as if to the manner born . . . Hope, on this CD, has not only put together a worthy tribute to his master, but also solidified his own reputation as an artist willing to extend himself. I much admire Daniel Hope and urge everyone who cherishes Menuhin's legacy to explore this homage. Besides the violinist's loving remembrance of one of the 20th century's towering musical figures, there's the continuity of Hope's exquisite playing. An artist at the height of his powers bows to his master, an experience not to be missed. Der Titelmix ist exzentrisch und aufregend. Neben Evergreens sind kaum bekannte rumänische Spezialitäten von Enescu und Jo Knümann dabei. Dabei herausgekommen ist eine faszinierende Stunde Musik, die man sich unbedingt in einem Zug anhören sollte, am besten in der von Hope festgelegten Reihenfolge. Die dramaturgische Sicht auf die Stücke, die Menuhin am Herzen lagen, sei ihm besonders wichtig, fügt Hope hinzu und unterstreicht die Vielschichtigkeit von dessen Musikgeschmack. Jedes Stück hat eine Verbindung zu Menuhin, wie eine musikalische Biographie.
. . . persönlich und von gemeinsamen Erfahrungen mit Menuhin geprägt ist somit das Album, das jetzt bei der Deutschen Grammophon erschienen ist . . . Besonders schön sind die sechs ausgewählten Stücke aus den 44 Duos für zwei Violinen von Béla Bartók, die Hope mit dem erst 14-jährigen Schweden Daniel Lozakovitj spielt.
. . . einer vielgestaltigen musikalischen Reise, auf die sich alle beteiligten Musiker inspiriert und mit Herzblut hingeben. Bemerkenswert, wie souverän und stilsicher Daniel Hope diesen überaus heterogenen Reigen an musikalischen Weiten durchschreitet und von Barock über die gemässigt avantgardistischen Klänge bis hin zu rumänischer Volksmusik, die passenden Spieltechniken und Geigentöne auspacken kann. The 22nd April 2016 would have been the 100th Birthday of violin legend Yehudi Menuhin, and Daniel Hope dedicates a complete album to his former mentor and close friend. Watch Daniel Hope playing "Salut d´amour" of Edward Elgar.